Now, with the brand new batteries in the cart all I had to do was reverse the procedure from yesterday. 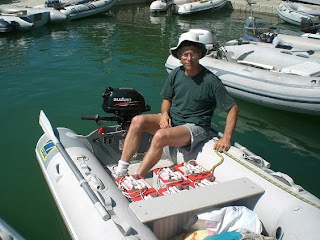 Of course this meant I had to run the batteries down to the dinghy, put them on the dock, lift them into the dinghy, motor out to the boat, lift them up on to the boat, over the cockpit and down into their hole. Once there, connect up all of the wires. No problem. 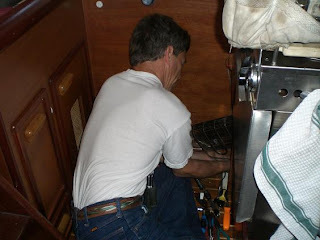 On about the 4th battery, with sweat going into my eyes, I was wondering about the sanity of living on a boat. Each of these 6 volt golf cart batteries weigh around 63lbs and today was one of those rare warm and humid days. Now, the batteries had to be hooked up with both series and parallel connections to produce the required voltage and amperage. I of course, couldn’t have a simple hook up, no, I also had added to this wiring mess a temperature probe and another set of battery cables so that the starting battery could charge with the house batteries. 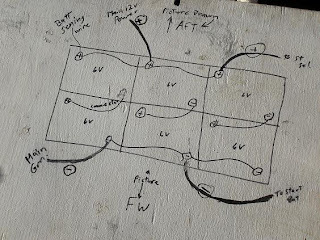 I even made a wiring schematic that is drawn onto the cover to the battery box just in case (as old age sets in) I start to forget where all those wires go. Finally, with a bit of cleaning up the battery hatch was closed and the cockpit grates went back into place. Turning the main switch on gave us the sound of the radio and the hum of the fridge as those little electrons again ran down the wires to do their work for us. One of the critical systems on Snow Goose is the storage of electricity. 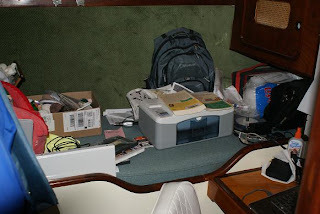 Many of the books that I read before starting on this boat project had the same mantra: “keep the boat small and your systems simple”. Needless to say I didn’t listen for we are neither small nor simple. In fact, at times I went a bit out of the way to make things more complicated. And so, our Achilles heel (so to speak) is electricity. The fridge is hungry for the stuff as is the computer, lighting, fans, pumps, coffee pot, toaster, Etc. All of them gobbling up those little electrons. This power is stored in a rather large set of ‘house’ batteries that I installed about 7 years ago. If you consider how long your car battery lasts then you know that after about 5 to 7 years, batteries start to go bad just as ours have. Today was the day to replace the old batteries with the new. 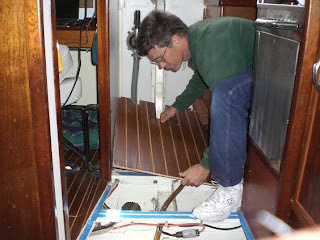 So, up came the cockpit grates and out of their hole the six, 60+lb batteries, went over the side and into the dinghy. 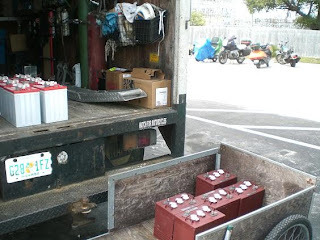 The batteries, all 360+lb of them, and another 300+lb of people and gear headed into the docks. (Anna wouldn’t get into the dinghy until she had personally read the owner’s manual and saw what the max load of the dinghy was.) I was glad that we had the new motor. At the dock, I lifted them out of the dinghy, lifted them again into a dock cart. I then ran the batteries up the ramp and to the waiting truck. Half of the job done. The timing was almost perfect. We received a call from the marina telling us that a large box had arrived…the new outboard was finally here! The only problem was that it had been raining for the last 20 hours with no relief in sight. I didn’t care, I needed that outboard. So, on with the foul weather gear and into the dinghy I went. 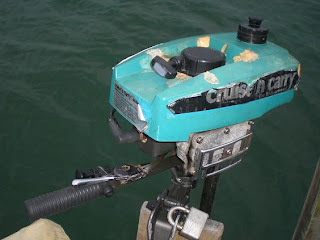 I fought with the old outboard and coaxed it to life (yet again) but I think that the old outboard knew this would be its last round trip for it didn't start easy and protested a lot on the way in. In the rain, I walked up to the service station for gas and back to the marina where I unpacked the new outboard only to find there was no owner’s manual! A quick call and a promised to send it in tomorrow’s mail was secured. Then, in the rain, I carried my new motor down the docks and laid it into the bottom of the dinghy. With one pull, I started the old 12lb beast for its last trip to the boat! It ran all of 15 seconds before dying and no matter what I did it wouldn’t start again. 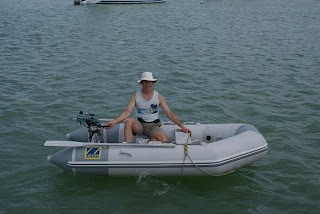 In the end, I had to row the new motor over a 1/3 of a mile out to the boat… in the rain, against the wind. 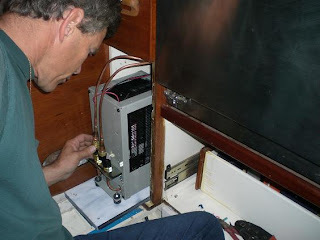 Afterwards, with a little bit of oil and gas the new outboard started right up and ran great! I think though, the old outboard got the last laugh. Taxes! Even on a boat you can’t escape taxes. OK,,,, this is going to be a rant!!! I just spent 5 hours working on them: Fed, State and local. This year it was a bit more complicated by the fact that I retired, had moved and I’m living in another state. 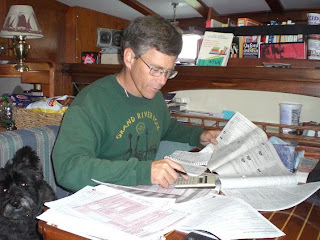 Why we can’t have a simple system that takes, say, 10% off the top with no deductions or earned income credit, no special exemptions for electric car purchase or simplified verses standard method to calculate pay back integration of retirement contribution distributions… YUCK!. Today things got a bit out of hand, imagine having a split-level house and you needed to removed the stairway to the upper level only, many of the things that you need to complete the job were still on the upper level. This is the situation that I faced. I had to remove the stairs to access the wiring runs under the floor and this made me climb like an ape into and out of the boat for stuff. Anna abandoned ship and went with some friends into town…I think she really had enough of my bad attitude. After a lot of words that can’t be printed here; the components of the compressor unit finally slid into its new home and the assorted wiring was hooked up and ready to go. With the flick of a circuit breaker, the unit began to hum and the freezer compartment cooled down. Now, the clean up begins. In a day or so we should have a photo album of the refrigerator replacement on the web site. 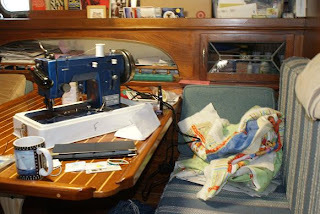 What a mess, we live in about a 200 Sq ft area and I have taken over about ½ of this space replacing the fridge. The old components of the fridge came out kicking and screaming. 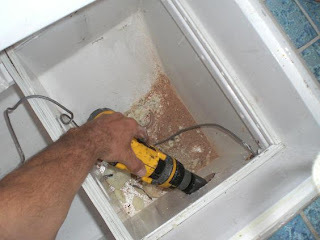 Then I had to drill a hole the size of a fist through the inside of the fridge to the outside so that I could pass the tubing through to the compressor compartment. The trouble was that the hole had to be drilled at a steep compound angle. I now have the kitchen covered with the residue of finely ground insulation and of wood dust. Anna and I carefully slid the evaporator tubes into the hole and I shot some foam into the hole. Then the waiting began for it takes 8 hours for the foam to cure. Tomorrow, more on the replacement. If nothing else about a boat, you can say that it has a finite amount of space! It has the capacity to hold only so much ‘stuff’ before the stuff begins to take over your life. Since this is my 4th boat I tried to take this into account when I rebuilt her and included over 110 different storage places. Alas, I should have built even more for stuff seems to be creeping out at night and invading our lives. Mostly this is because Anna and I have two different approaches to life on board and each approach is valid it's own way. I believe that if you are done for now with something put it away and Anna believes that until you are done with something don’t put it away. This issues is the one area of disagreement that creates the most tension between us. So, as with most people, we have agreed to disagree and now have two different modes of clutter on the Snow Goose, Sailing mode & Harbor mode,,, and, as you can see, we are definitely in Harbor mode. The noises that you hear when you live on a boat soon become a back ground rhythm in your life. Everything from the slapping of the waves against the hull or the slow creak of the anchor rope as it stretches with each gust of the wind. The sound of dinghies motoring by or the occasional call of “Snow Goose… anyone home"? These are typical background sounds of life. There's one sound that's harder to get use to, it’s the sound of the wind when it’s blowing hard and for the last 2 days the wind has been doing just that. It’s been about 15 to 20 MPH with higher gusts. The wind sways the boat back and forth and tugs at the dinghy on the rear cleat. It sounds alive as it moans in the rigging with its “whoooo’s” and sighs. In stronger gusts the wind begins to roar like an angry beast or a train passing in the night. You awake in the night and are taunted buy the wind you as you try to get back to sleep. 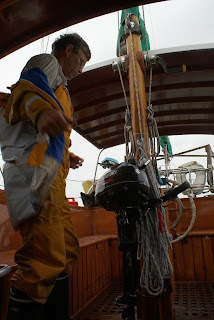 It rattles the wire on the spinnaker pole or bangs the mast with a loose halyard. At times it shakes the rigging with its strength. 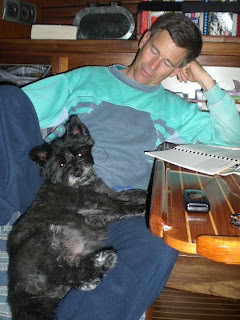 This is why, when I’m lying there awake and the wind is roaring in the rigging I recall the best lesson that the wind has taught me…that a secure mooring or a well dug in second anchor is the best remedy for wind blown insomnia on a boat. For two nights I have gotten up, dressed warm and sat in the cockpit. No, it’s not insomnia, it’s the space shuttle. The space center is about 250 miles away but I had heard that you could see the launch even from here. 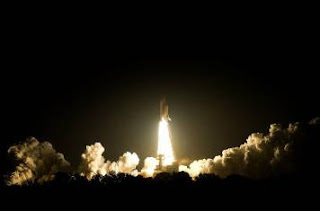 The first night the launch was scrubbed because of high winds but last night, at 4:14 AM it was a go! There in the distance, a red streak appeared, it looked like a red flare shot into the night as it rose above the lights of the city. Within a minute, the twin boosters separated and a new star rose into the night sky. How cool. PPS. OK, the pict. was lifted from the NASA website. One of the great things about being out on the hook is the lack of any bugs. Seldom do you see a mosquito or fly. Well, that all came to an end last night when the wind died away and the no-seeum came out for dinner. Being from the north I had never dealt with this flying set of teeth. Even though I have camped and hiked many places I had never been eaten up by something that I could barely see. 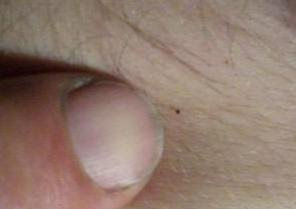 They are nothing but a black speck that you could easily confuse for a bit of dirt until you feel that BITE! About the size of a large grain of salt these pint size pests will drive you crazy. The worst thing is that you have to close up the boat just when you want everything as wide open as possible to catch every stray breeze. Here is a picture I took of one of these winged piranhas as it settled on my leg for his evening meal. (Just to give you an idea of their size). The next day, Anna and I were covered with small welts from our dinner guests. 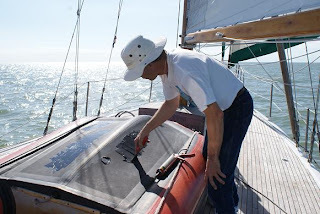 A week or so ago I attempted to make the dinghy last a bit longer I decided to stop the leaks in the bottom by covering the old sun eaten rubber with a bit of black urethane-rubber from a calking tube that I had purchased at the big box store. This product is equivalent to 3M's 4200 and has worked for me over many years and several different boats. I’ve even used it to seal up the holes in my sea boats! And after a day to set up, it worked, no more leaks in the dinghy bottom. Well, Good news!!! We have a REAL dinghy!!! 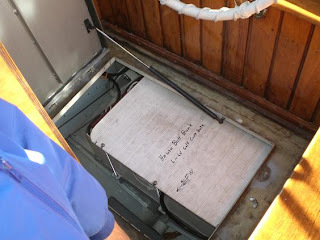 On the VHF morning radio net someone announced that they had a dinghy for sale and we bought it! It’s not exactly what I wanted but it's a great step up from what we had. Now, to replace the 12 lb wonder. Wed. is pot luck night. It’s designed to get the “new” boaters in the harbor to come out and greet people. When we arrived it looked like half of the harbor was there! Afterwards there was music under the Tiki hut. As the songs came and went different people would join in to sing or play music. 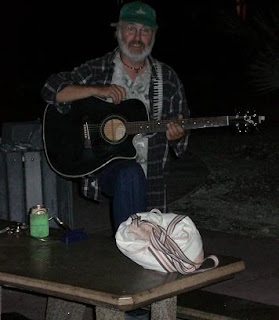 A great night of new friends, talk and song. We were assigned a mooring yesterday and will be moving to our new home this morning, # M10. If you’re in the harbor stop by! In the tale of the Odyssey, Odysseus and his crew landed on the island of the Lotus-eaters. Once there, many of his men ate of the lotus plant and fell under a spell. They stopped caring about leaving or even getting back to their land of Ithaca. All they wanted was to stay in the land of the Lotus-eaters. Marathon is like the mythical land of the Lotus-eaters. The harbor at Marathon is well protected and efficiently run by the city and the harbor has room for those who want to anchor out too. The amenities provided by the city are excellent and the price is good! Your days start cool then become sunny and warm filled with lots of entertainment that a busy harbor can provide. The people and businesses of Marathon are boater friendly and almost everything that you might need is within walking distant. They have a pot-luck on Wed. an impromptu musical get together down by the water under the tiki hut on Sat. The morning cruiser net gives information to anyone who wants to listen. The water is filled with every type of boat from derelict boat bums to 60foot gold plated beauties and all seem to get along well. To top it off, they are dog friendly, and encourage you to stay for a day, a month or a year. I’m trying hard not to eat of the Lotus plant but,,,Edie and I both think that a taste couldn't hurt!